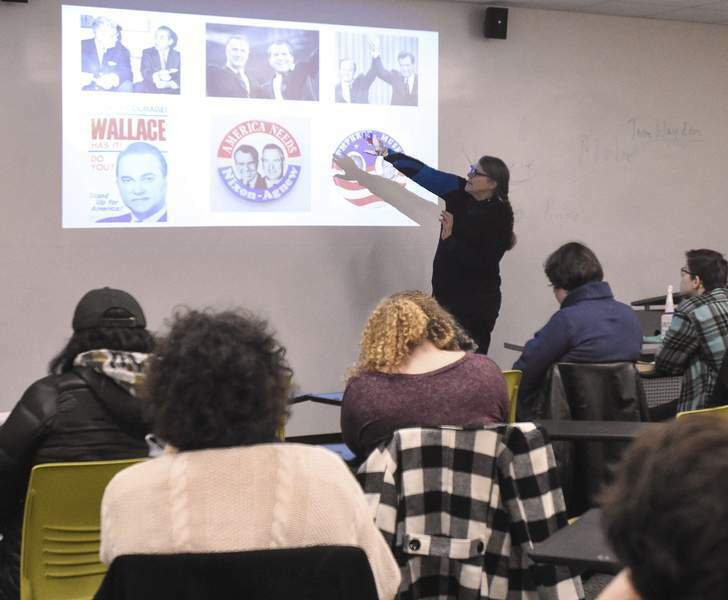 Michelle Davies | The Journal Gazette Purdue Fort Wayne professor Christine Erickson leads her class in a discussion of the 1968 presidential election. The election was one of the subjects in a team-taught class on the history of a half-century ago. 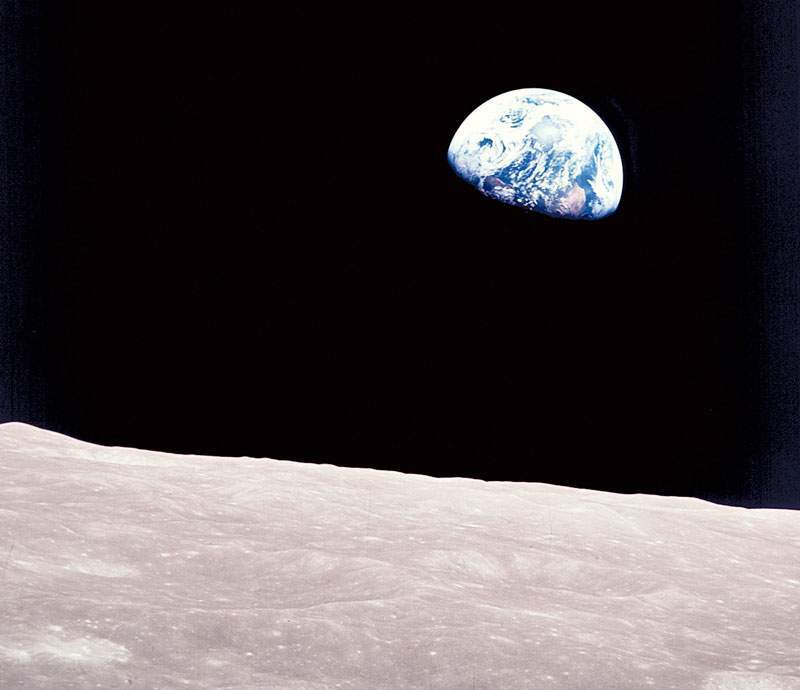 NASA “Earthrise,” shot by the crew of Apollo VIII on Dec. 24, 1968, became an early symbol of the then-emerging environmental movement. The topics in the classroom discussion at Purdue Fort Wayne might have seemed familiar to anyone. A razor-close presidential election, won by a candidate who promised to bring change and heal the country but also stoked fear and racism as part of his campaign strategy. Bitter political rifts that ripped families apart. Riots in France. Escalating concern about the environment and struggles over basic civil rights. An unwinnable war dragging on in a country far away. Tension with North Korea. This was not a current-events class, though, but a history course that looked back on a year that has striking similarities to our tumultuous time. There was a lot going on. The assassinations of civil rights leader Martin Luther King Jr. and presidential candidate Sen. Robert F. Kennedy. A youth movement brought the emergence of the counterculture and unsettling new forms of political expression and repression here and abroad – riots and harsh police response at the Democratic Convention in Chicago, the Prague Spring protests in Czechoslovakia, and the killing of student protesters just before the politically charged Summer Olympics in Mexico City. Triumphs in the U.S. space program and advances in computers that seemed wondrous in 1968 laid the groundwork for everyday technology people then could barely have imagined. “I got interested in this time period because my dad lived through it,” said senior class member Fyodor Wheeler. “He was in the Air Force and he was sent to Korea after the USS Pueblo was taken” by the North Koreans in January 1968. Larry Wheeler, a DeKalb County resident who maintains microwave radio tower equipment, came to two of the class sessions with Fyodor. Though he found the presentations interesting, “there's no way you could convey the emotions that were going on at that time,” Wheeler said. “Every young man dreaded the trip to the mailbox,” where a notice from the draft board might have arrived. To avoid being drafted into the Army, Wheeler enlisted in the Air Force, where he helped train pilots who were going into combat in Vietnam. After the Pueblo and its crew were seized, he was deployed with the 4th Tactical Fighter Wing to Korea, where his commander was famed airman Chuck Yeager. At the same time, the massive North Vietnamese Tet Offensive was under way, making it clear that the United States was in for a long war in Vietnam. The Korean crisis abated after the ship's crew was released that December, but the Vietnam conflict was to rage on until 1975. During a class discussion, Wheeler, 71, shared his memory of what it was like then. “The United States was in the process of committing suicide,” he said. “The country was falling apart. There was so much anger in the streets – rioting – because of the draft; people were revolting. Student sit-ins were going on. “I feel like you learn from the past,” said 35-year-old returning student Michael Gerardot, a senior who sees similarities to today in the civil unrest, feminism and battles for minority rights that happened in 1968. If some of the issues are the same, Gerardot said, so too is the political backlash. Gerardot had just finished listening to Erickson's incisive analysis of the 1968 presidential campaign, in which Republican Richard Nixon positioned himself between Democrat Hubert Humphrey on the left and third-party candidate George Wallace on the far right. Four years before, Sen. Barry Goldwater had been soundly defeated by President Lyndon Johnson. But Goldwater, Erickson told the class, had demonstrated that a Republican conservative could make inroads in the once-solidly Democratic South. In the years leading up to the 1968 race, Nixon had secured his path to the Republican nomination by building support in the border and northern states, while he quietly courted Southern leaders. “He was conservative but not too conservative,” Erickson said. “The political demands of the hour required that Nixon walk a tightrope to distance himself from Wallace's kind of explicit appeal to race, but at the same time to tap into that undercurrent of racial hostility,” she said. When he was vice president under President Dwight Eisenhower during the 1950s, Nixon had been an early supporter of civil rights. The pivotal 1968 election was closer than many people realized, Erickson said. Though Wallace “understood that he would not be elected president,” there was a chance the election would be so close that the decision would revert to the House, where Wallace's Southern support might allow him to exact concessions from one of the other candidates, she said. Despite a political climate of conflict and division, the nation was making audacious leaps in technology. In the class' final lecture, associate professor David G. Schuster tried to conjure the magic of the moment when Apollo VIII lifted off on Dec. 21, 1968; it would mark the first time humans left Eatrh's orbit and traveled to the Moon. Then Schuster showed the class another video, made four days later, as the astronauts were circling the moon. “It gives me chills still to hear that,” Schuster told the students. “Can't we care about both?” another student asked. “We're getting closer and closer to Mars,” one student suggested. Maybe the fight against global warming, another student said. “Welcome to 1968” students ran the gamut from young to old, with very different reasons for taking the class, and very different reactions. “I've had an interest in the '60s in general for quite awhile,” said Aaron Ehler-ding, a 23-year-old senior. “There was a lot going on, a lot of major social changes that I think are interesting.” Ehlerding, who became especially interested in the European protest movements after a trip to Europe, said he sees similarity in today's youthful political movements, and is heartened by them. The 72-year-old Harris was auditing the course to see what he missed. Harris sees parallels today, too, but he greets them with a shrug. ''To me, with all my years of experience, it's the same. There's nothing changing. The same old stuff as usual – dirty politics, capitalism vs. communism – same old stuff. ... It doesn't matter whether the party changes, Democrat or Republican, they're all the same,” Harris said. 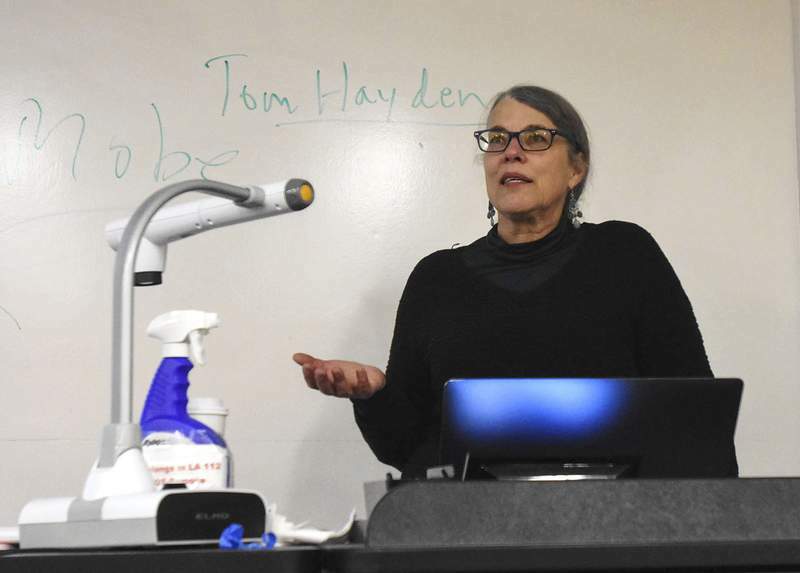 Erickson said last week she hasn't had time yet to look at all the class evaluations, but the history team may well consider team-teaching about other notable years – perhaps about 1919 next year. To Schuster, the course offers a valuable reminder that as bad as things might sometimes seem, there were times in the past that were even more trying. Looming in the background in those days, Schuster noted, was the ever-present possibility of all-out nuclear war. Schuster recalled when singer Country Joe McDonald – of the war-protest music group Country Joe and the Fish – spoke on campus a few years ago. ''You hear the hyperbole today, where people say we're more divided now than we've ever been,” Schuster said. 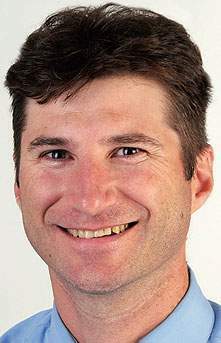 Tim Harmon is an editorial writer for The Journal Gazette.